Ruth Wilson Gilmore, "Seeing: The Problem"
Ruth Wilson Gilmore delivers a free, public lecture as part of the Intra-Disciplinary Seminar series. The talk explores technologies of seeing — images, surveillance, film, categories, terror, and representation — to think about the current frenzy of people circulating visuals as though the materials “speak for themselves." Topics include the Berlin Conference, Kodak’s innovations, imperial uses of anti-slavery, science, lynching, prison, postcards, and the scopic imperatives of colonialism, apartheid, and class war. Gilmore will end by tracing out contradictions that might provisionally ground decolonial practice to enliven consciousness through re-seeing experience. 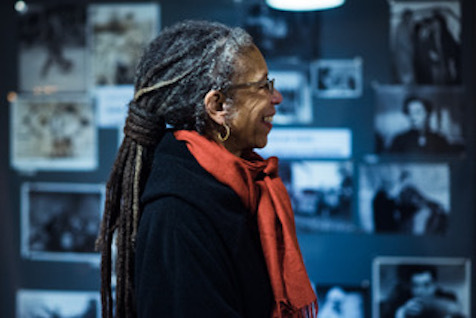 Ruth Wilson Gilmore is professor of earth & environmental studies, and American studies at the Graduate Center of the City University of New York, where she is also Director of the Center for Place, Culture, and Politics. She writes about abolition, racial capitalism, organized violence, organized abandonment, changing state structure, criminalization, and labor and social movements. A second edition of her groundbreaking Golden Gulag will appear soon. Recent publications include “Beyond Bratton” (with Craig Gilmore, in Policing the Planet, Camp and Heatherton, eds. ), and “Abolition Geography and the Problem of Innocence” (in Futures of Black Radicalism, Lubin and Johnson, eds.). She is a co-founder of many grassroots organizations including California Prison Moratorium Project; Critical Resistance; and the Central California Environmental Justice Network. Honors include the American Studies Association Angela Y. Davis Award for Public Scholarship (2012); the Association of American Geographers' Harold Rose Award for Anti-Racist Research and Practice (2014); the SUNY-Purchase College Eugene V. Grant Distinguished Scholar Prize for Social and Environmental Justice (2015-16); and the American Studies Association Richard A Yarborough Mentorship Award (2017).